Für mich eines der besten Alben der letzen Jahre!! Ist bei mir im Schrank gelandet. Kaufte mir dieses Album nur, damit ich mitreden konnte. 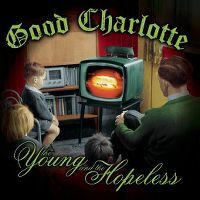 Good Charlotte hat mich nicht überzeugt. Einige Songs (v.a. die Ausgekoppelten Songs) sind gut bis sehr gut, der Rest ist jedoch beliebig austauschbar und nichts spezielles. Solide 4.
ich liebe dieses album..fast noch besser als "the chronicles of life and death"...aber good charlotte sind einfach die besten!!!! Das erste Album gefiel mir besser.Aber The Young And The Hopeless-Song ist spitze! Best album by the band a riot from start to finish. The album went Platinum in the UK. 42 weeks in the UK top 100. 1 week US top 10. US#7. World Chart Year End (2003): #53. 436,000 copies sold in the UK. 3.4 million copies sold in the US. Year end (UK): #47 (03). ohhh, i'm somewhat ashamed to admit that this album would be among my top five of all time, possibly my top three. i have played this album from beginning to finish over 100 times all up and it got me through a lot of teenage pressures (haha). while i didn't think much about most of the singles bar the anthem and hold on, standouts included say anything and emotionless. emotionless is my favourite track on the album, i just felt that one!!! imho, this album is awesome. Momentan noch das Stärkste Album der Jungs! Damals noch im klassischen Punk-Rock Stil.